Anesthesia is often a missed opportunity, but a key value driver in a surgical facility. Moving to a first class anesthesia EMR solution provides the tools to unlock gains in efficiency and patient care, but it must be a solution that providers embrace due to its ease-of-use and integrated fit with the complex workflows in the surgical environment. Please complete all fields to view the video. © 2019 Plexus Technology Group, LLC. All Rights Reserved. "We selected Plexus TG as we found their system to be the most intuitive on the market and one that our end users will find very efficient. Plexus TG has also been responsive to our needs, tailoring the system to meet our specific workflow requirements." 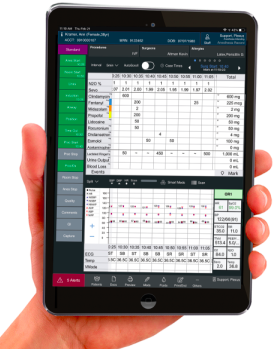 The Anesthesia Touch solution is available as both a Windows application and an iOS (iPad) app—choose either or both. The mobility of a hybrid or tablet solution is a strong complement to anesthesia workflow, as anesthesiologists provide care in many physical locations. Clinicians can document on one platform and return to the case on another based on what's available near the patient. Anesthesia Touch leverages the simplicity of deploying and supporting on both platforms, from one-click application installs, to server side configuration and automatic updates. Anesthesia Touch truly has the simplicity of an app. Integration with the facility's EHR system is essential for quality care and efficient operation—for the anesthesia department and also for the rest of your organization. Our integration leverages both traditional HL7 and newer standards such as the Continuity of Care Document (CCD) popularized by the Meaningful Use certification program. Check out the Anesthesia Touch Overview Demo Video! Anesthesia Touch is an automated medical recordkeeping system that streamlines the capture of real-time anesthesia data throughout the perioperative process, enabling anesthesia providers to deliver safe, effective care to patients. After watching the Anesthesia Touch Overview Video, if you would like to learn more about Plexus TG's anesthesia EMR solution, please schedule an online demo.